Oh, get lost you offbeat rinky-dink. You’re nowhere. Gangsters on a Boat is not exactly Snakes on a Plane, which is probably for the best. 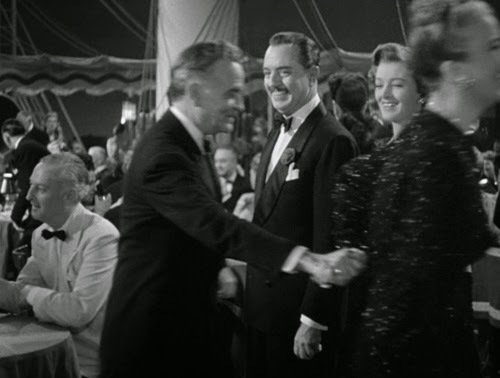 The final bow of Nick and Nora is their weakest outing but, like mother’s flit gun, it is by no means devoid of charm. There is the feeling that the spark and enthusiasm has been slightly dulled, however. 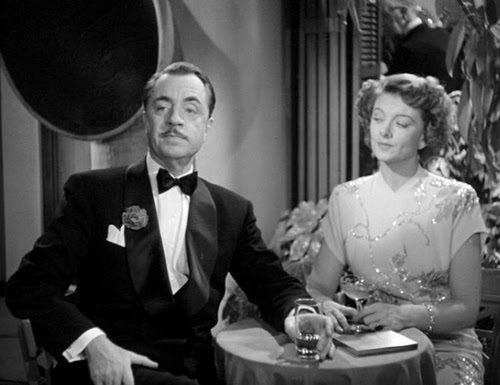 In particular, William Powell seems more stolid than before. And then there’s the willingness to indulge the hepcat musical numbers. With such detours anyone would think this was one of the MGM Marx Brothers comedies (appropriately, or perhaps not, Edward Buzzell also directed a couple of their diminishing returns pictures). But it’s nigh on impossible to dent the easy rapport between Powell and Myrna Loy, even if it shouldn’t be right that their formerly anarchic reign over proceedings should give way to their being labelled “The squarest couple of hipsters I’ve ever seen”. Although a return to the world of crime bosses ought to be right up the Charles’ street, the affair is muffled. As happened with some of those aforementioned Marx Brothers movies, at times there’s a feeling that Nick and Nora are passing time on the fringes of their own show. 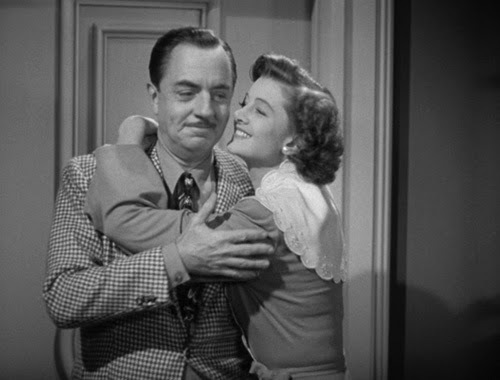 In the first Thin Man Nick and Nora were the life and soul (well, Nick certainly was). Now he’s an elder statesman; “Mr Charles is a bit of a shmo”. He shouldn’t be, though. The scene of the crime (well the first crime) has potential; a gambling ship called the S.S. Fortune. 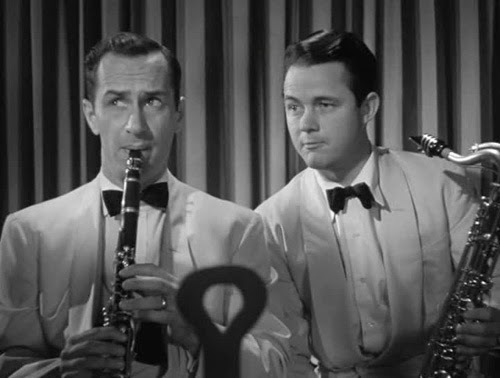 The heavily indebted leader of a jazz troupe is shot dead, and there are more than enough suspects who might have a beef against him; the gangster he owed, the ship’s owner whom he was attempting to steal from, the band’s losing-it clarinettist. As far as the mystery side goes Song isn’t badly constructed, but the unfolding is mostly indifferent. Perhaps it’s that Buzzell is unable to inject any momentum into the proceedings, or perhaps it’s that few of the cast really take hold, but more than ever it’s only Nick and Nora’s antics keeping this going. The difference is, before they were the fuel rather than the just another part of the cake mix. If you don’t guess the murderer it’s probably because you don’t really care. There may be a certain pizzazz to the way Nick stages his customary reveal on the reopened ship, with a gathering of the potentials, but when the murderer reveals his own identity with a “Never mind. I’ll tell them”, and he’s hasn’t been accused let alone sweated under hot lights, it’s all a bit limp. Nevertheless, there are numerous bright spots. 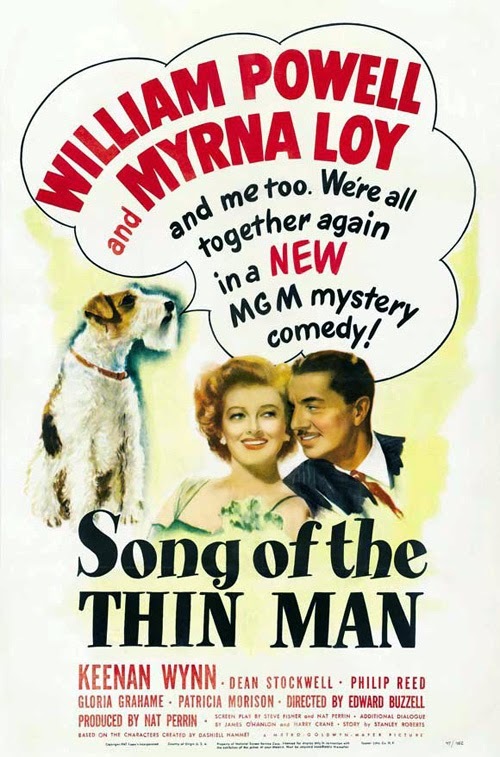 Keenan Wynn becomes Nick’s nominal sidekick, as musician Clarence “Clinker” Krause, while Gloria Grahame is memorable as moll singer Fran. Less certain is Don Taylor as Buddy Hollis, whose has had his “mind shattered by alcohol”. It’s come to something that a series that celebrated over-indulgence feels the need to sign off on a note of caution; this is what the evil liquor can do to you kids. Thank goodness Nick hardly even sniffs it any more. Taylor went on to become a director, most notably with the likes of Escape from Planet of the Apes and Damien: Omen II (as you might guess, most of his output was TV). More alarming is that in order to service the plot Nick and Nora remove the poor sap from his rest home and put him back on stage to lure a killer. It’s a bit laissez-faire to endanger a non-criminal cohort (Clarence’s reluctance to get up on stage with Buddy is more appropriately amusing). Mention should be made of the returning Nick Jr after a hiatus when the Charles went home. 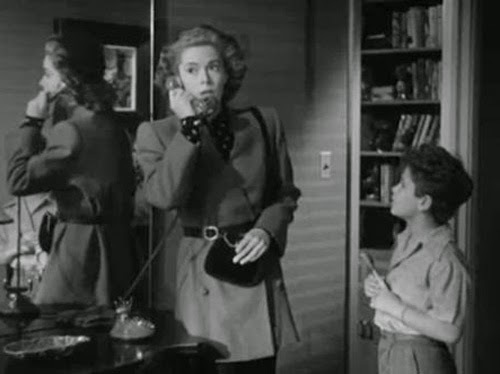 This time, none other than Dean Stockwell plays the little terror. He has a few good moments with Powell, even if Jr’s presence adds to the patchwork feel of the picture. “Looks like a page out of Esquire” comments Nick. “Not the page I saw,” replies his chip off the old block. Then there’s dad’s refusal to tell him a bedtime tale; “But your stories always put me to sleep” protests his son. Strangest of all is the protracted spanking sequence. It’s difficult to ascertain quite what was intended here, not forgetting we were “treated” to Nick spanking his wife in the previous picture. This time Nora instructs her husband to punish Nick Jr, but every time he raises his hand he sees nostalgic images of their good times overlaid on his son’s behind. It appears to be getting at an anti-corporal punishment angle, until Nick recalls his son laughing at him and then gives him a rigorous beating… Only for us to discover Nick Jr had a glove down his trousers all along. “Did you know about the glove?” demands Nora to a protesting husband. Asta is as sprightly as ever (in his second Asta Mk II appearance), finding an IOU, letting out a belch and having his fearsomeness warned against “Just one word from me and that dog of mine will tear you to pieces”. The jazz talk is mostly an opportunity for Loy to show some surprising adeptness with the lingo; “Oh, get lost you offbeat rinkydink. You’re nowhere,” she tells a bouncer. This is a world of jivey hepwarblers and cries of “Lay it on me, man. Lay it on me” during a solo. None of it really takes, and the inclusion of a frowning Beethoven bust at the end of a performance may not be coincidental (it’s certainly as visually creative as the director gets). 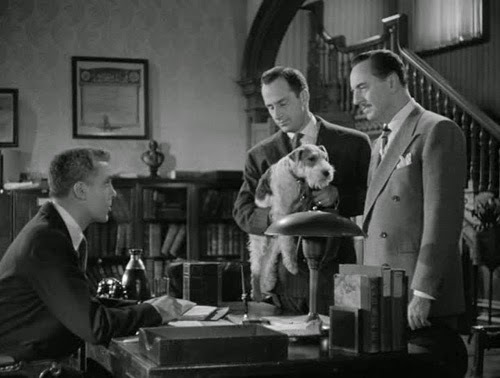 Elsewhere Nora invokes Sherlock Holmes after telling gangster Al Amboy (William Bishop) it would be silly to have killed Drake; “If a guy owes you money and you kill him, he can’t pay you”. “Very smart” says Drake. “Elementary” corrects Nora. 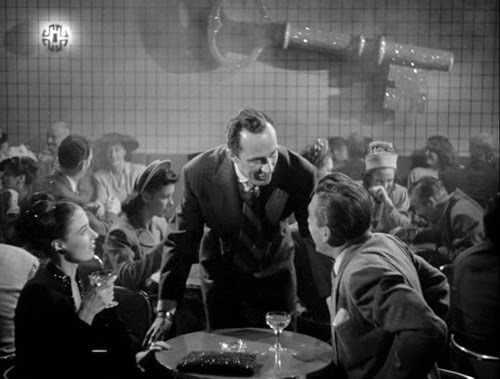 There’s a wee bit of metatextuality about Nick’s technique, although not as much as Nora reciting the script of the big reveal in the earlier Shadow of the Thin Man; “Oh, I see. All you have to do to prove your innocence is confess your guilt” she levels at her husband when he rejects a likely suspect. Elsewhere a cabbie asks, “Follow that car?” and Nora comments “Movie fan”. 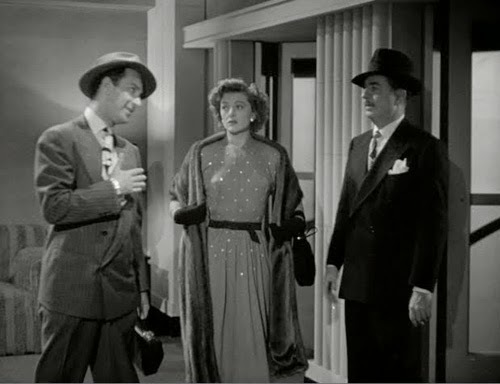 The most inspired comic interlude might be the highly amusing scene in which a hotel clerk is quizzed about the comings and goings of a suspect. He insists that discretion is his watchword before unleashing a torrent of carefully eavesdropped insights; “That’s all I know about her because I don’t go snooping on our guests”. Nick is pretty much off the sauce during this one, and even two years on from Goes Home there just isn’t the same energy in Powell’s performance. He’s good natured and affable, but definitely not rising to the occasion. There’s also less sauce between him and Nora (he even takes her along on some investigative work without giving her the slip, a sure sign things aren’t what they were). 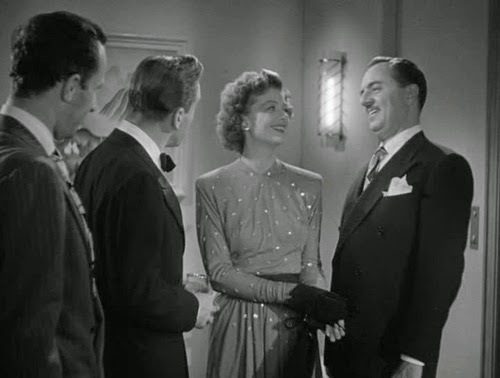 He notes that 4am “is my brandy hour” but Nora gets the best sozzled line when hubby warns her to get down on the ground if things get rough; “I’m practically under the table now, but not the way I like to be” she retorts. His best line might be to the undercover officer whose gun is peeking from beneath his jacket; “Sergeant, your slip is showing”. Nick: And now, Nick Charles is going to retire. Nora: You’re through with crime? Nick: No, I’m going to bed.